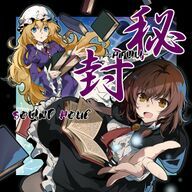 Secret Sealing  (秘封 -HIFUU-, hifuu) is a doujin album by SOUND HOLIC released on 2018-12-30 (Comiket 95). It features vocal and instrumental arrangements of themes from Ghostly Field Club, Changeability of Strange Dream, Retrospective 53 minutes, Magical Astronomy, and Trojan Green Asteroid. ↑ A reference to the Secret Sealing Club.